Twenty-four short stories told from a unique perspective and insight. 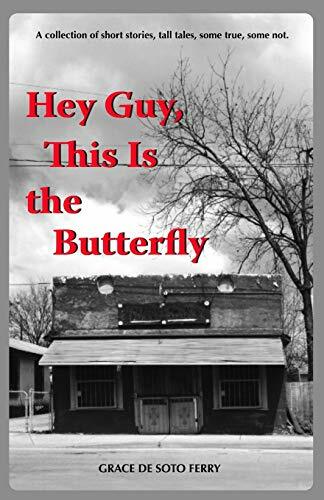 "Hey Guy, This Is the Butterfly" is a collection of short stories that will entertain the reader with tales that make you laugh, such as "John Wayne Wears a Girdle," and "The One-Eyed Saint of Muddy Creek." Feel the pain of a teenage girl having to give her baby away in "Someone Should Change the Sign" The author recalls growing up in San Antonio, Texas when being Mexican-American was regarded as a liability. "Passing For White" is told by a girl who doesn’t like her name nor the fact that she’s fat. It’s summer and she can only swim on non-white days. The only way to get in the pool is to pass for white. In "Blessed Benny the Benevolent," an unemployed woman finds herself in the strange little town of Marfa, Texas. She’s rescued by a kind-hearted man who helps her regain faith in herself. Two young children find that brotherly love can conquer fear in "Black Moon Rising." Some of the stories are told from the point of view of a young person and others from an adult perspective. All 24 stories have spontaneity, humor, warmth and a sense of place and time. Grace De Soto Ferry was born in San Antonio, Texas in 1944. She grew up in the Mexican neighborhood on the West Side. In 1965 she moved to Los Angeles. She’s married to filmmaker John Ferry. They’ve been married forty-four years and have one son. She now lives in Santa Barbara, California. Grace has co-written and produced three documentaries. "Hey Guy, This is The Butterfly" is her first book of short stories.